Water blisters are fairly common. They happen to everyone at one time or another, and there are many possible causes. Fortunately, these tender spots are simple to treat and usually take little time to heal. Water blisters are comprised of blood serum, minus the clotting agents and blood cells. When the body detects damage to the outer layer of the skin, it sends blood to the area in order to heal and cool the area. Acting as a protective shield, the serum pads the wound and prevents further harm from taking place. These painful water-filled bumps appear most frequently on the hands and feet, but can form anywhere. Unlike blood blisters, the water variety appears as a bulbous pocket of water. Single blisters or clusters may appear wherever the body needs healing. These pockets of serum come in different shapes, from round to oval. Small ones may look like clear pimples while large blisters can be the size of a nickel or quarter, depending on its cause. 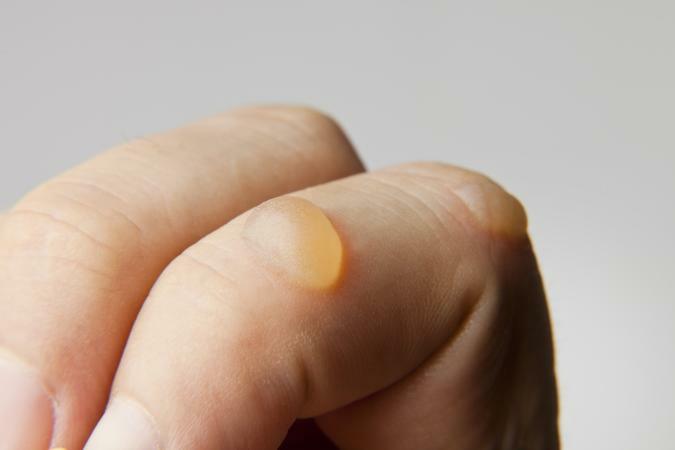 While these are the common explanations, they are not the only causes of water blisters. According to Healthline, blisters can also be caused by skin conditions, such as: pemphigus, porphyrias, epidermolysis bullosa, and dermatitis herpetiformis. Taking proper care of a blister (or blisters) is essential to avoid pain or discomfort during the healing process. For the most part, water blisters do not require treatment. They will heal on their own in a few days or weeks, depending on the size and cause. However, certain things can slow down healing, such as infection and placement. The best way to take care of a blister is to avoid what caused it. Beyond that, there are several at home remedies to help the skin look and feel better. The Reader's Digest article, "9 Ways to Heal Blisters on Feet or Anywhere," mentions protecting the area with bandages, applying aloe vera, and giving it plenty of time to breathe. While water blisters may not be aesthetically pleasing, they actually keep the wound sterile. Popping a blister can increase your risk of infection and slow down the natural healing process. There are some occasions when it is appropriate to drain or pop a water blister. For instance, if the area is painful, causes extreme discomfort, or has begun to leak fluid, it may need to be drained. Remove any clothing covering the water bumps. Wash your hands thoroughly using soap and warm water. This limits the chances of exposing the skin to infection. Immerse a needle in rubbing alcohol. It should be totally immersed to be completely sanitized. Dampen a washcloth, wring out excess water, and then squirt a dab of liquid soap on the cloth. Wipe the area with the soapy cloth to clean the surface of the skin. Using the needle, puncture the blister along the outer edge. Push out the fluid gently, guiding the serum out of the hole. Pat the blister with clean gauze, dabbing any excess water. Avoid tearing or pulling the skin flap away. Dab on an antibiotic cream containing polymixin B. Cover the broken blister with a gauze pad. If you are unsure whether or not you should pop a blister, consult with a medical professional. They can determine the best course of action. Sports enthusiasts often experience these blisters. 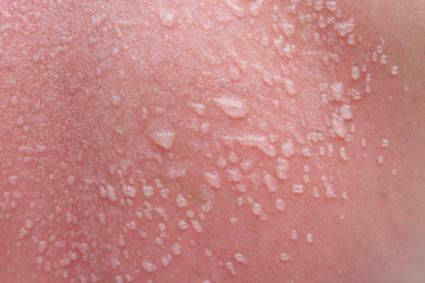 The Walking Site says that friction, sweating and heat can cause it to occur. The best thing you can do in the future is focus on prevention. The number one cause of a blister is ill-fitting shoes. Shoes that are too large or too small can cause friction. A rule of a thumb when shopping is to have half inch an inch of space between the toe and end of the shoe. It should not slip on easily or move around when you walk. Additionally, be sure to examine the shoes for seams that may rub against the skin. Water intake can affect your overall skin condition. Keep it moist and supple by staying hydrated. If you are sweating excessively, swap water for drinks that have a sodium replacement. Be sure to wear proper socks as well. Avoid wearing old, thin socks, as they will not provide you with enough protection. Socks should fit properly, be the right size, and consist of light cotton materials. When the body heals from a painful sunburn, it often produces blisters. The key to protecting your skin is to avoid a sunburn altogether. Protect your skin by applying sunscreen with an SPF of 30 or higher, re-apply throughout the day, and wear sun-safe clothing. To avoid further problems, focus on keeping the skin as safe as possible. Stop any action that has caused water blisters to appear - and take precautions to prevent their development in the future. Anytime a blister shows a sign of infection or poor healing, visit a doctor for treatment.